This archive page will mainly feature photos that don’t fall into any particular category. 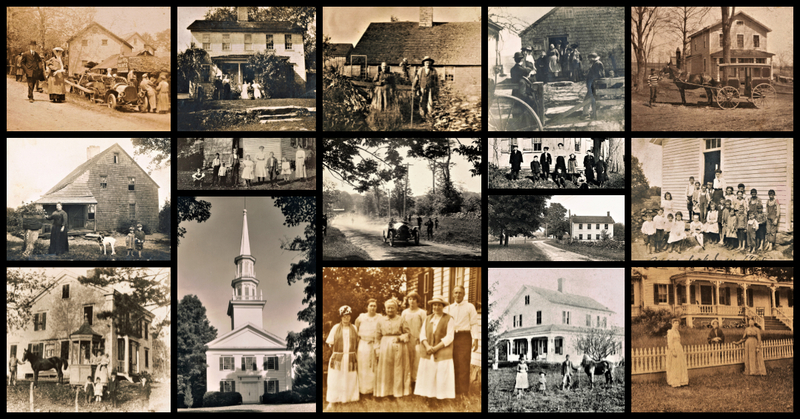 For vintage detailed photos of our notable neighbors, historic homes, churches, schools, agriculture, the Bridgeport Hydraulic Company & the historic Sport Hill Races of the early twentieth century, please click on those links below the Photo Archives tab on our main page. Eventually, we hope to have as many as 500 photos online and viewable to all. 1982. The Aspetuck Reservoir during an extreme drought. Gasoline engines such as the Fairbanks – Morse brand replaced traditional water power in sawmills during the early part of the 20th century. Gillette Tucker & Company from Easton represented the brand in the 1930’s. Burton Merwin sold groceries and ran the Aspetuck Post Office from this mill starting in 1891. By the early 1900’s he was making wooden toys on the upper floor. Located at the corner of Westport & Old Redding Roads. 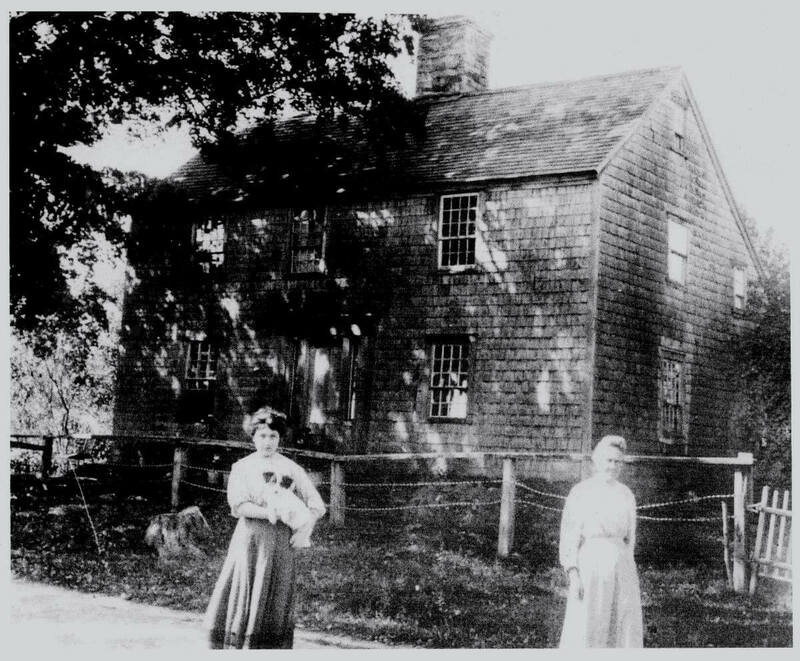 Platt’s Blacksmith Shop in 1922 at the foot of Sport Hill before it crossed the Mill River near the Fairfield Line. Albert Hawkins near the Sport Hill Ledge in the early 1900’s. The road was moved to the east and straightened in the 1940’s. 1910 George Platt’s old sawmill at foot of Sport Hill Road. The Yellow Bowl Tea Room on Sport Hill Road in the 1930’s. 11/09/1963. The groundbreaking cemermony for the Helen Keller Middle School. First Selectman Franklin Hubbell at far right. 1934 Aerial photo of Sport Hill Road showing the twin radio towers of WICC that were erected in 1927. The building at the center that housed the broadcasting equipment is now a residence. Orlando Banks and his wife circa 1900. The Banks farm was taken by eminent domain for the construction of the Aspetuck Reservoir a few years later. Undated photo with the results of a black squirrel hunt. Unsure if this was for sport or bounty. 1937 plans for the new town hall. Notice that it had a courtroom on the main level and that the town library was located in the basement. Late 1920’s – early 1930’s. Single bay fire department. After a devastating 1929 fire that destroyed the Grange Hall, a new building was started in 1932. George B. Beers, the first Master of the Grange turns the first shovel of dirt. Past Masters of the Grange in 1932. We have the names too! 1932 Grange officers and officials w/list of names! Surviving charter members of the Grange in 1932. The original Arcan Ridge house in 1941. It would be lost to fire in 1946. May 30, 1937. The Bluebird baseball team…and yes, we have the names too! Gustav Pfeiffer built the little replica mill that we all refer to as the “Toy Factory” sometime around 1935. Note the long gone water wheel. It was only for show, but it did turn when the water was allowed to flow over it. Ruman Brother’s Store on the corner of Center & Westport Road. C.1917. Bill Gregory went by the name Bill Injun. Whether he was actually of Native American heritage may never be known, but the old-timers in the middle of the last century liked to tell the story of the old Indian who did odd jobs and lived in a shack near the corner of Sport Hill & Rock House Roads. c. 1895 photo. 1925 Easton Boy Scouts camping at Lordship Bluffs. 1933. Easton Forest Rangers at the University of Connecticut. L to R: Jay Sherwood Edwards, John King, Sterling Gillette, Ed Johnson, Albert Wilkes & Fred O’Hara. 1925. Easton Boy Scouts at Lordship Bluffs campout in Stratford. When it was perfectly safe to transport children in the back of an open truck! c.1905. The Adams schoolhouse in its original setting. Looking east from Sport Hill Road, Adams Road at the right. C.1920’s. Union Cemetery looking north on Sport Hill Road. 1930’s. Easton Coach Service bus in front of Halzack’s. Note the old blacksmith shop still standing in the rear of the building. Sport Hill Road looking south at the Mill River Bridge. C. 1900. 1947. A second bay had been added to house additional equipment. The boys bought something called a televsion set around that time and membership suddenly swelled. 1947 Donkey Baseball players. Fun at the Volunteer Firemen’s Carnival! Artist Stevan Dohanos used many local landmarks in his works, this one of the Congregational Church is from an August 1949 illustration in Life Magazine. 1938 the construction of the Merritt Parkway in the Plattsville section of town. 1942. The Connecticut Railway & Lighting Company (CRL) regularly ran buses to Easton that provided transportation to Bridgeport. The Bluebird Garage was used in the filming of the 2007 movie Reservation Road starring Juoquin Phoenix, Mark Ruffalo, Jennifer Connelly, Mira Sorvino, Elle Fanning et al. 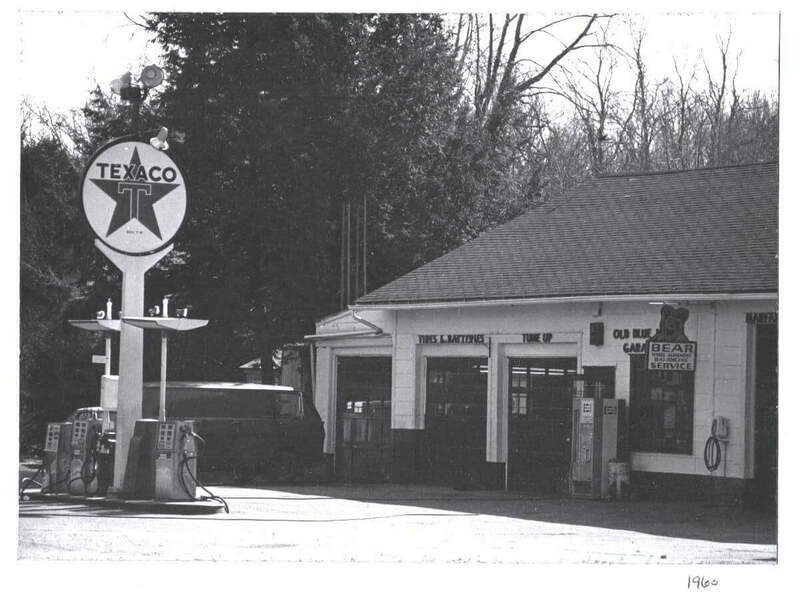 Likely taken in the late 1920’s to early 1930’s given the signage. Signs atop the building in the later 1930’s sported bluebirds on either side of the name. The Date of this postcard/picture is not known. This second or counterfeit Bluebird sat about in the middle of what is now the little league field parking lot at Aspetuck Park. 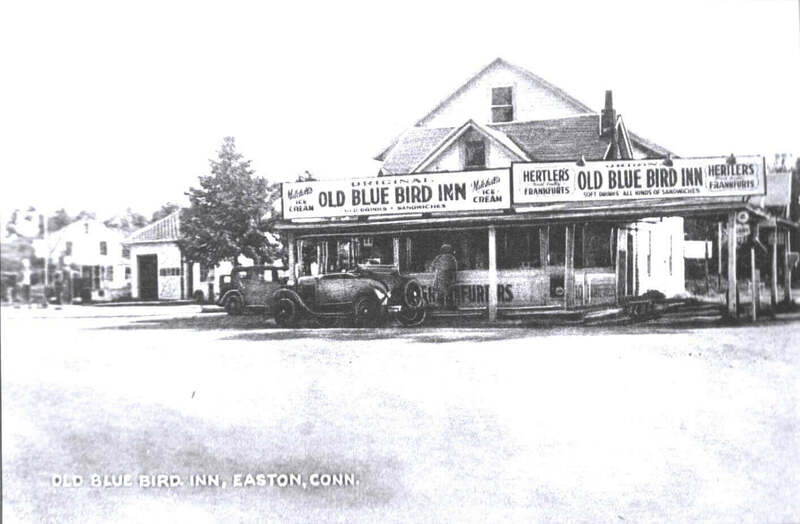 The Bluebird Inn and Garage – photo taken between 1934 and 1937. 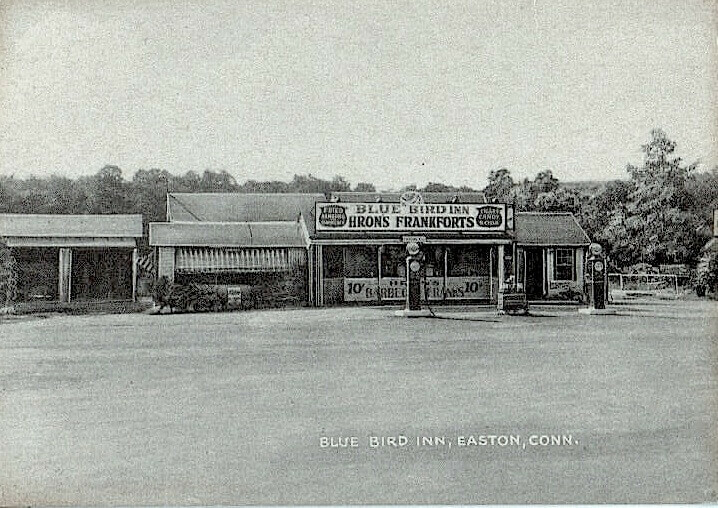 I remember the Bluebird Inn well. In the early 1950’s, my sister and I walked from my grandfather’s farm on Burr Street to the Bluebird to buy ice cream cones. I was about six years old and we were on a grand adventure. Thanks for the great flashback. My first job in approximately 1975 was at the Blue Bird. It was a hot dog stand at the time owned by Bob Kern, the husband of teacher Midge Clark. My classmate, Cindy Spencer, also worked with me making milk shakes and selling hot dogs. Since I lived on Mile Common Road I could just walk to work and then hang out at the Mud Hole with the gang afterwards. The Blue Bird! In the late ’60’s, my brother and I played Little League across the street. Win or lose, ten or fifteen cents was the prize to be spent at the Bluebird! 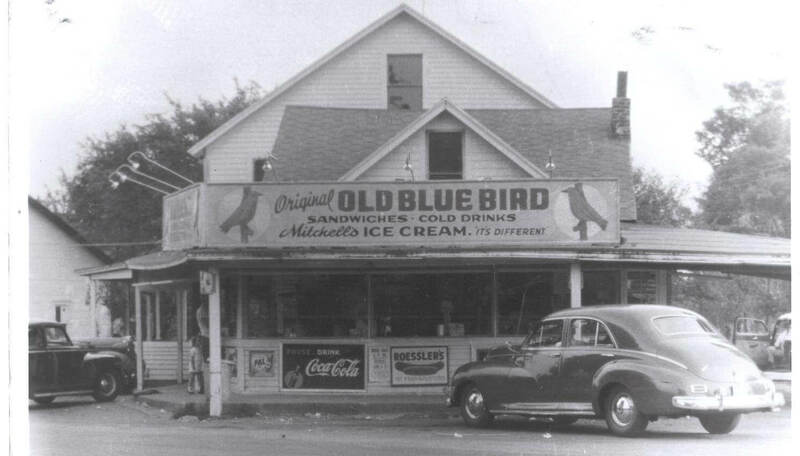 In the 1930’s, on family trips from Danbury to Fairfield Beach, we always stopped at the Bluebird for little cups of ice cream. The interior of the lids had pictures of famous people. It was joy to open the cup for both the photo in the lid an the ice cream. I think that one cup cost ten cents. Then in the 1960’s our sons played Little League in Toth Park. Will always remember Hank Kowaleski who was a great umpire and an even better man. My mom and I loved the black raspberry shakes – most likely made by Donna or Cindy (above), because that’s about the time I was playing Little League at (what is no longer called) Toth Park. 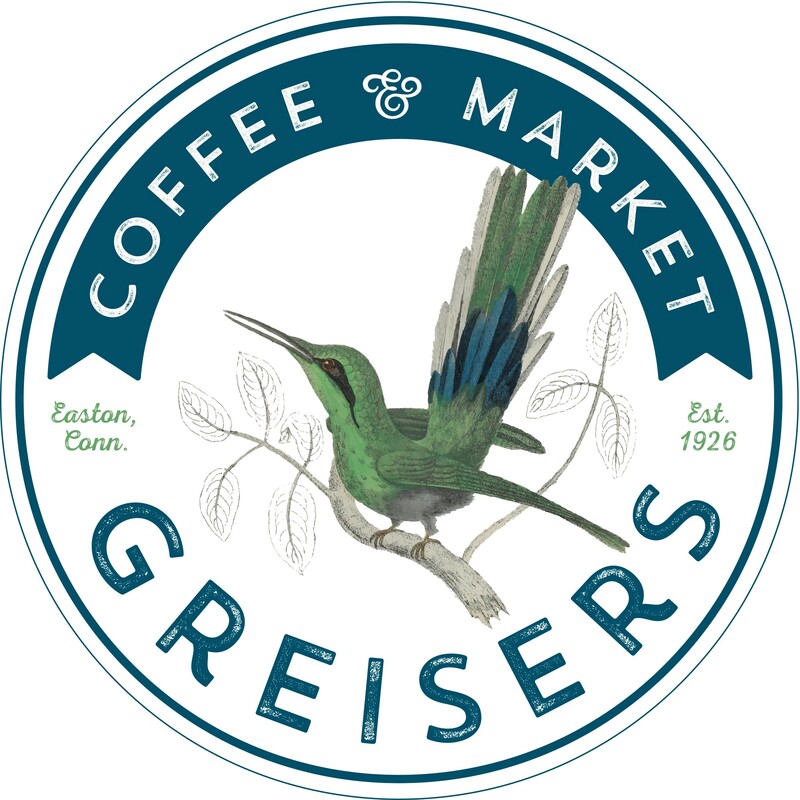 I never went to Greiser’s growing up, but when I was editor of The Easton Courier in ’89-’90, I went there a lot. Good place to get coffee and talk with the regulars. Miss the Bluebird and Greiser’s A LOT. I would to learn more of Easton’s history. My husband’s grandma was born there in 1937. Are there any school photos from the 40s? Staples Elementary appeared to only take class photos of the graduating 8th grade each year. If your relative was born in 1937, she would have likely been in the Staples class of 1951. We do not have that year in our photo album. If you could provide a full maiden name, we can check to see if we can find a photo for you from one of the high schools Easton used during those years.